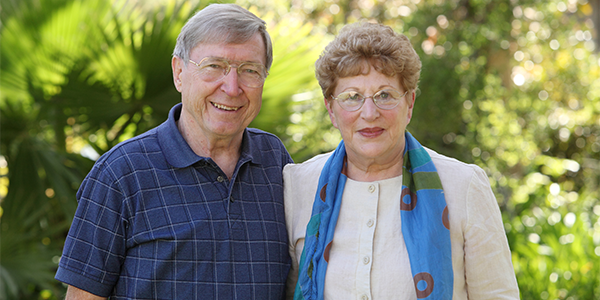 Leo '59 and Molly Moellering '60 Tautfest began a lifelong partnership in ministry at Westmont. For two summers, they participated in Lei O'Limas, a 10-week outreach program assisting churches in Hawaii. Leo describes it as a forerunner of Potter's Clay, the annual student ministry in Mexico. After graduating from Westmont, Leo earned a master of divinity degree at San Francisco Theological Seminary and served as a Presbyterian pastor for 32 years. He also completed a master's degree in counseling at Lewis and Clark College in 1980 and did a lot of pastoral counseling. Molly raised their two daughters and spent 22 years teaching English as a second language at Mt. Hood Community College in Portland, Ore. After Leo retired, he joined her as an ESL teacher for eight years. "One of the most exciting and satisfying parts of our ministry has been the intense involvement with people from other cultures," Molly says. The Tautfests have met refugees from all over the world and have helped some get settled in the United States. For four years they served together in Palermo and Torino, Italy, where Leo pastored Waldensian congregations, which are connected to the Presbyterian Church. Living in a different culture and learning another language challenged them in positive ways. Early in their careers, the couple looked for ways to involve youth in a service project. As Leo was a pastor in a rural parish, they chose Heifer International and have volunteered for this organization ever since. Working to end poverty and hunger is important to Leo and Molly, and they see this program as a way to teach the importance of social justice. "One reason we established a bequest and have stayed involved with Westmont is its focus on social justice," Leo says. "The college fills a unique niche in higher education, and the emphasis on outreach and service is important. Our country and world need people who are honest, committed, informed, critical thinkers who won't be led around by the loudest voice or biggest celebrity. Westmont's combination of faith and responsible citizenship prepares students to be that kind of person." Reproduced with permission from the summer 2010 issue of the Westmont College Magazine.